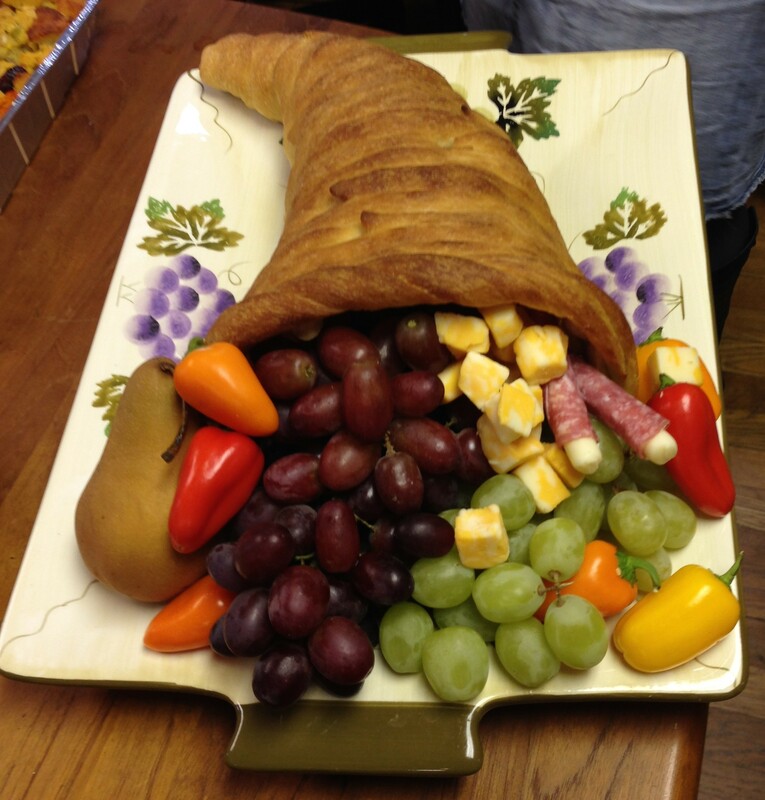 This beautiful cornucopia spilled over with all the kids’ favorite healthy snacks! Holidays at The New Century School are special not just because of the unique, meaningful ways TNCS celebrates, but also because the school seizes the chance to give back to the surrounding community and beyond. After a Fall semester full of fundraising initiatives and community outreach, TNCS spent the last school-day in November by sharing a Thanksgiving/Cultural Feast to share our collective gratitude as well as taste delicious dishes from around the world. The Feast was the perfect culmination of the first two Units of Inquiry for the 2014–2015 school year: Community Building and People/Families Around the World. Parents were asked to contribute a dish representing their culture to their child’s class feast. As has become the norm, TNCS parents really brought it. The following slideshow represents just a “taste” of the schoolwide event, but is more than enough to make your mouths water, viewers! What hard work was the antecedent to this lovely reward? Lots and lots of it. Neighbors and families came out in force—there wasn’t a crumb remaining after the 30-minute sale! Mrs. DuPrau and her proud 1st- and 2nd-graders. 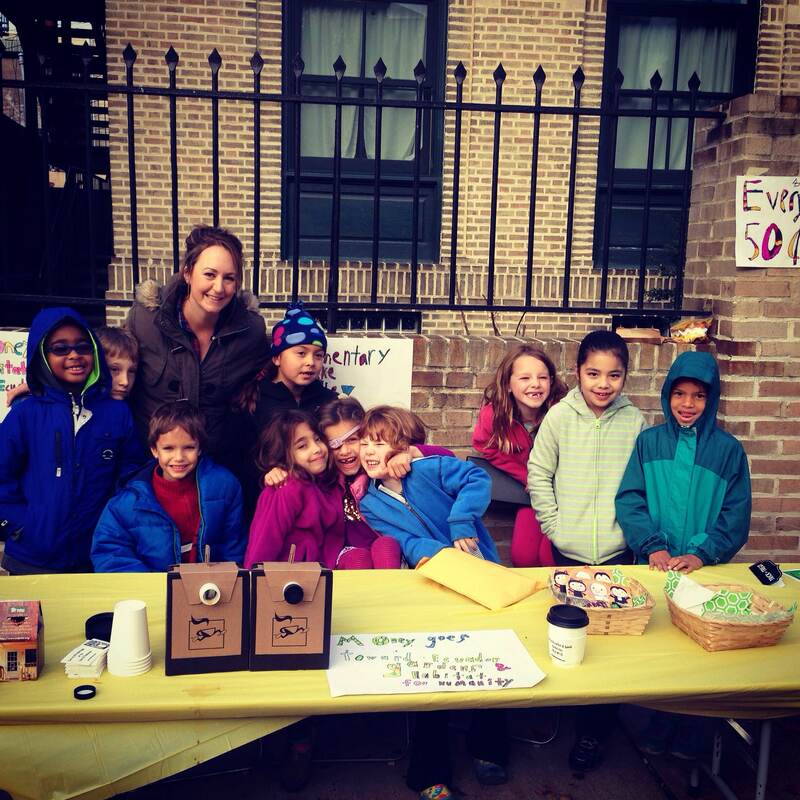 TNCS elementary kids held the school’s first-ever bake sale and donated their proceeds to help raise funds for Habitat for Humanity. The bake sale was an astronomical success due to both the tempting goodies up for sale and to the savvy promotional campaign that preceded the event (students designed their own posters and signage). Mrs. DuPrau’s homeroom class was proud to contribute more than $300 to Habitat. Another local beneficiary was the Help Rebuild Thames Street Park Playground initiative right here in Fell’s Point. TNCS students use this playground regularly, so Head of School Alicia Danyali ran a school-wide fundraiser through Mixed Bag Designs and gave all of the proceeds—more than $1,700—to the playground renovations! Well done, TNCS community! True to form, the TNCS community is finding other ways to demonstrate their inherent altruism. Such creative and inspiring acts include enrolling in the sustainable energy program provided by Viridian, which helps the planet and earns fund for TNCS. Haven’t enrolled yet? Read more: TNCS Uses Viridian’s Power with Purpose! And, elementary students are once more partnering with Councilman Jim Kraft’s office to do some good around Southeast Baltimore. See what they are jointly cooking up: TNCS and Councilman Kraft: Outreach for Our Shared Community. TNCS provides students with regular opportunities to share their resources and goodwill, and our little humanitarians will learn very important life lessons as a result of this important practice in gratitude. So thank you, TNCS! Beans & Bread—it’s not only the nutritionally perfect combination of protein and carbohydrate, but it suggests new possibilities, just as Jack’s magic beans opened up a new world via his giant beanstalk. With the autumn holiday season gearing up, The New Century School is counting blessings, taking stock of its manifold accomplishments, and looking for ways to share its good fortune with the surrounding community. So, just as TNCS did last year, we are once again hosting a food drive from 11/13 through 11/22 to donate to St. Vincent de Paul’s Beans & Bread program. Head of School Alicia Danyali says, “We chose Beans & Bread because they are close to the school, and we feel strongly that giving back should be kept in the neighborhood or in close proximity to what would make a difference locally.” TNCS is participating in a measurable way in keeping Fell’s Point viable and sustaining. Emphasize low-fat, low-sugar, whole-grain foods that you would serve your own family! A copy of this list was sent home in your child’s school bag. Sounds eminently doable! 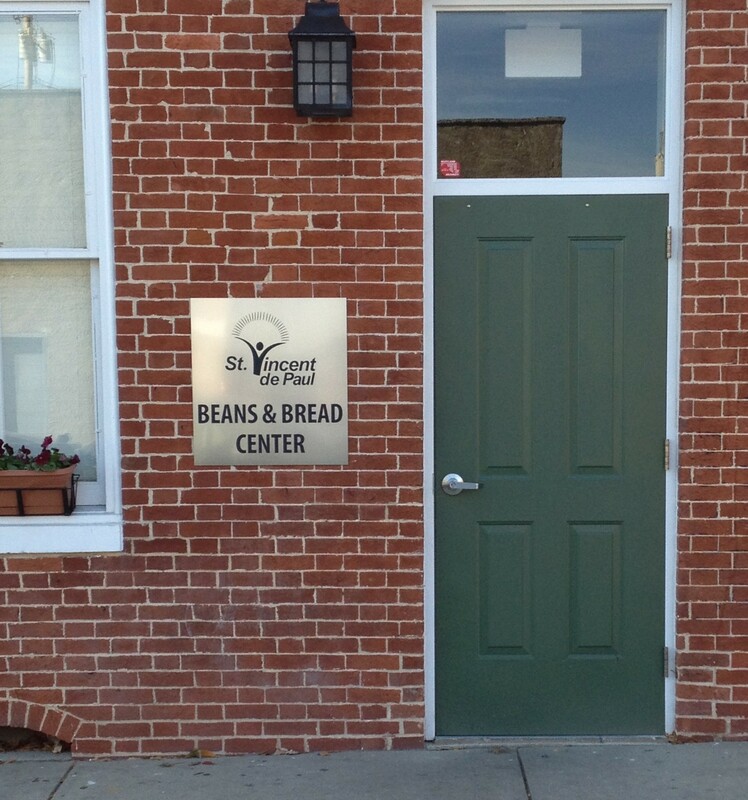 Partnering with United Way of Central Maryland’s Healthy Food Initiative, Beans & Bread asks for food items to be those that you would serve to your own family. 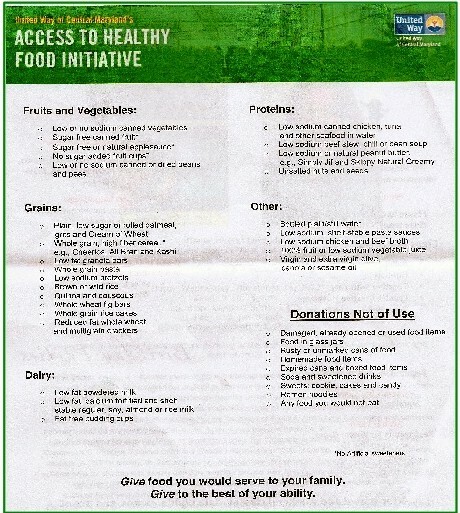 Also, choose whole-grain and low-fat options when possible, avoiding sugar-added and sweetened food and drinks. 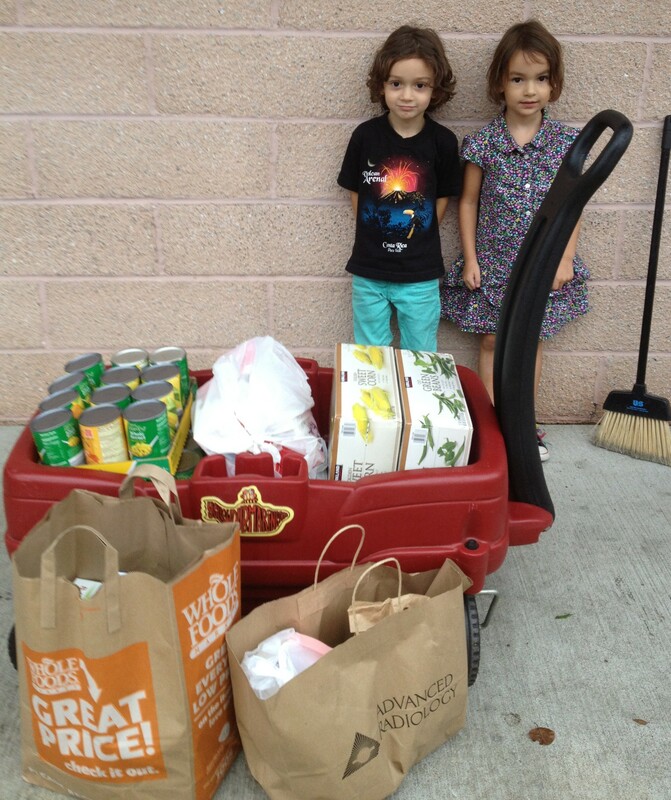 True to form, the TNCS community is finding other ways to demonstrate their inherent altruism. Such creative and inspiring acts include donating surplus Halloween candy to deployed armed forces, for example. Another idea that caught on like wildfire among TNCS families was asking for charitable donations in lieu of birthday gifts at kids’ parties. Local hunger charities (such as Beans & Bread and Our Daily Bread) welcome canned goods collected at these parties, or cast your net more broadly and request small monetary donations to buy livestock through Heifer International, as one family did. Not only do the beneficiaries of these donations see immediate life improvement and empowerment, but your kids get the lifelong reward of learning to share and give. It’s wonderful to see how they so naturally welcome the idea, even when it means giving up birthday presents! Howsoever you decide to share your wealth, remember that you will actually derive personal benefit from your selflessness—a beautiful paradox! Being altruistic is a recognized happiness inducer! 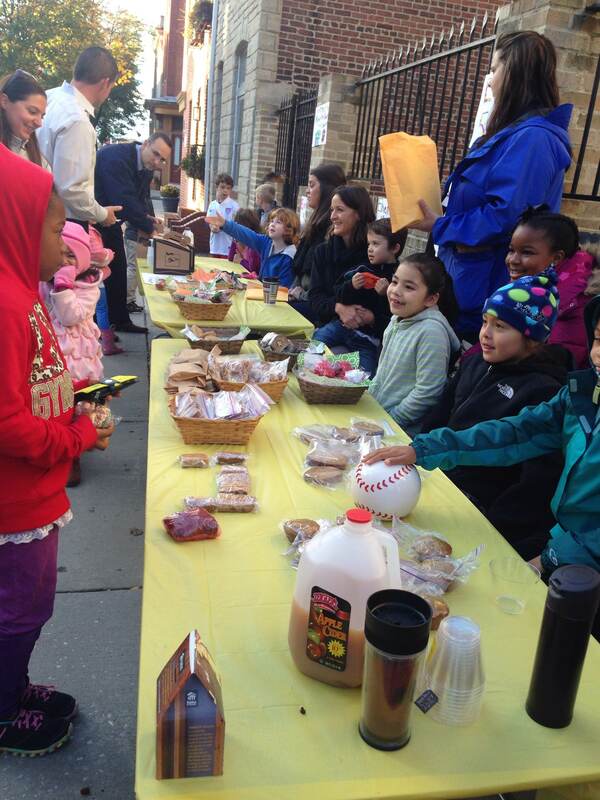 Proceeds from our 5th birthday party went to Our Daily Bread! We were so happy that our friends helped us feed our Baltimore neighbors, and we enjoyed meeting the volunteers at ODB and seeing their huge kitchen :)!